UPDATE JUNE 2, 2018. Version 5 of the PPW Tools panel has just been released. You can download the new version at our free resources page. If you are having any difficulty with the previous version (4.1.1 for CC201x) you should upgrade now. This page discusses, first, problems in getting the PPW panel installed; second, what to do if the panel has been installed but certain features do not function properly. These comments apply to version 5.0 for Photoshop CC201x, released June 2, 2018. If you are trying to troubleshoot an installation into Photoshop CS6, you’re on the wrong page; go here instead. This release has only been tested in Photoshops CC2017 and CC2018. It seems to work in CC2019 as well As far as we know it should also work in earlier versions of Photoshop CC201x, but we cannot offer support. Also, every release of Photoshop CC has broken this and/or other panels. We get very little lead time before new releases. When one occurs, you should not assume that the panel will work properly until we post a confirmation here. In reporting problems with the panel, please be specific as to what is happening and what your system configuration is (see the troubleshooting guide below). Statements like “it doesn’t work” are not helpful. This installer works per user account. If you wish to use the panel on more than one account you must install it twice. Windows users should right-click on Photoshop to run as administrator while installing the panel, even if you otherwise have administrator privileges. Those who do not wish to use version 5.0 can still download the actions and documentation here without installing the panel. Once installed, the panel can be accessed under Window: Extensions, not under Filter or anything else, provided that Photoshop: Preferences>Plug-Ins>Load Extension Panels has not been unchecked. You must quit and restart Photoshop before the panel will appear. If you attempt to access under Window: Extensions and receive a message saying that the panel is not properly signed, it suggests that some metadata on the files has been changed, which causes the digital signature to fail. The likely causes: duplicates of the extension folders, probably caused by failure to uninstall the previous version; or storing the package on some cloud drive that has modified the metadata. and if any of the PPW folders are found there (in principle, they shouldn’t be) delete them as well. If you are attempting to install under Mojave, and the panel appears to install correctly but will not open, it suggests a permissions issue. Note: in Mac OS Library files are hidden by default. Consult your system documentation, if necessary, to find them. 2) One or both of these CEP folders may contain four folders identified as PPW. Delete all of them. 3) Search for the file com.cromaline.PPWtools_5 and if it exists, record each instance. We may need this information if your manual installation fails. 4) Download the zipped file of four PPW folders here and copy them into the appropriate CEP folder. 5) Download the folder Cromaline_Software here and copy it into the appropriate Applications/Adobe Photoshop CC20xx/Presets/Scripts folder, replacing the existing Cromaline_Software folder if necessary. Be sure that your choice of which folder to use matches that of your choice of CEP folder, whether systemwide or single user. 6) Restart your Mac. The PPW panel should now be accessible when you launch Photoshop. The installer automatically removes all previous versions of the PPW panel. We do not know of any reason why you would ever wish to go back to version 4.1.1, but for the time being we provide links to download it for Macintosh, to download it for Windows, and to troubleshoot v 4.1.1. If you cannot install the panel at all, or if you have received a message that it has been installed successfully but it does not appear under Window:Extensions, or if the panel appears there but you cannot open it, we will try to help, but we need specific information. Fill out the following, and post it here or e-mail it to one of us if you have our addresses. *The operating system you are using. *The exact name of the file, including suffix, that you downloaded and are attempting to install from. *Did you verify that in Photoshop: Preferences>Plug-ins, “Load Extension Panels” and “Allow Extensions to Connect to the Internet” are checked? *Whether any other Extensions are found under Window: Extensions, and if so, which. *The exact version of Photoshop that you are using, taken from the “About Photoshop” panel (e.g. Adobe Photoshop CS6 version 13.0 x64). Note: we know that many people still use Photoshop CS6, so we continue to support them. However, we believe that few people still use versions of Photoshop CC earlier than CC2018. Tens of thousands of users have demonstrated that the PPW panel works correctly with them, but we cannot predict compatibility with future operating systems. We are therefore not disposed to investigate any problems involving these three versions. *Whether the copy of Photoshop you are using is a trial version or whether you have subscribed. *Whether you have ever previously installed any version of the PPW panel on this system (this includes previous attempts to install the one you are having trouble with); if so, did you uninstall it prior to installing the new version? *A detailed step-by-step of what happens when you try to install, including the text of any error messages you receive, and whether you got a message that the installation was successful. Accuracy is vital here because we are going to try to replicate your procedure. In writing it up, pretend you are preparing it for someone who doesn’t know anything about Photoshop. *If you have installed the panel but when you attempt to open it you get the message “PPW Tools extension could not be loaded because it was not properly signed,” have you gone through the procedure outlined just above this section to eliminate duplicate folders? *If your OS is Mojave, have you attempted a manual installation as described above? *Verify that the top left tab of the panel reads PPW Tools 5, and that there are no duplicate folders as described above. *A complete description of the problem you are experiencing. *Whether you have administrator privileges; if you are using Windows, did you right-click Photoshop and run as administrator while you were installing the panel? *The exact version of Photoshop that you are using, taken from the “About Photoshop” panel (e.g. Adobe Photoshop CS6 version 13.0 x64). Note: we know that many people still use CS6, so we continue to support them. However, we believe that few people still use Photoshops CC, CC2014, or CC2015. Tens of thousands of users have demonstrated that the PPW panel works correctly with them, but we cannot predict compatibility with future operating systems. We are therefore not disposed to investigate any problems involving these three versions. *Does any other version of the PPW panel show under Window: Extensions? *Have you opened the Preferences panel (accessible in the top right of the main panel) and reset all three of the preferences in the bottom section? *If you are reporting that the MMM or the MMM + CB actions are working normally but failing to complete in certain rare instances, the likely cause is that a certain channel in the selected area is completely uniform, no variation at all. 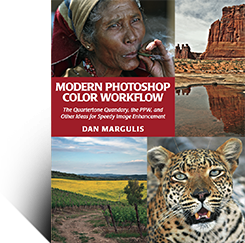 This is extremely unusual in unretouched photographs because Photoshop by default adds a tiny dither when moving from RGB to LAB. However, it may occur in computer-generated art, or where Filter: Blur>Average has been used before trying to run the action. The workaround is either to add an infinitesimal amount of noise to the affected area, or to add to the selection Shift-select a pixel or two from an unrelated area. In response to your request for more information on my problem, below is more discussion and your troubleshooting questions answered. Hopefully the formatting will survive posting…. fine and as expected. But the panel does not work (except for the two darken sky buttons). After uninstalling the “old” PPW panel (which worked fine in cc2014) and installing the cc2015 beta per the instructions included with the beta, the panel ceases to work in BOTH cc2014 and cc2015, with the error message and/or non-functionality detailed below. I can, by re-installing the “old” version thru AEM get the panel working again in cc2014. Windows 7 with current patches. *The exact version of Photoshop that you are using, taken from the “About Photoshop” panel (e.g. Adobe Photoshop CS6. version 13.0 x64). Installed per the instructions provided with the Beta PPW panel, including uninstalling old version thru adobe extension manager first. No errors, nothing unusual. Installation seemed to go off fine. *If you have received a message that the installation was successful, but the panel does not show under Window: Extensions, have you verified that Photoshop: Preferences>Plug-Ins>Load Extension Panels is checked, and that you have quit and restarted Photoshop? “Exception:TypeError: undefined is not an object” with an OK button on the dialog. *Whether you have administrator privileges. Yes I have administrator privileges. Yes, the panel worked fine in cc2014. Yes, I uninstalled it before installing the beta for cc2015. No, only version 4 shows. *Whether your version of Photoshop is a trial version or whether you have subscribed. Yes I have, it had no effect. *If you are reporting that the options panels cannot be accessed in Photoshop CC2015, verify that you are using Photoshop v. 16.0.1 or higher. *If you are reporting that certain actions (e.g. Darken Sky SC) return masks that are inverted from what is expected, go to the dropdown menu of the Channels palette. Choose New Channel and be sure that Color indicates Masked Areas is checked. If Selected Areas has been checked instead, the channels will be inverted. *If you are reporting that the MMM or the MMM + CB actions are failing to complete in certain instances, the likely cause is that a certain channel in the selected area is completely uniform, no variation at all. This is extremely rare in unretouched photographs because Photoshop by default adds a tiny dither when moving from RGB to LAB. However, it may occur in computer-generated art, or where Filter: Blur>Average has been used before trying to run the action. The workaround is either to add an infinitesimal amount of noise to the affected area, or to add to the selection Shift-select a pixel or two from an unrelated area. These buttons do nothing. Their actions work as they should. *If your problem pertains either to the Sharpen 2015 or the Bigger Hammer action, please a) attempt to run the other action from the panel and tell us whether it works normally; b) please try to run both actions not from the panel but from the Filter menu bar (the installer puts a copy there automatically) and tell us what happens, and whether it is the same thing that happens when you try to run it out of the panel. The bigger hammer and sharpen 2015 buttons both do nothing when clicked. Both of the actions run normally and correctly. *If you are reporting an error message stating “The object ‘MARGULIS PPW ACTIONS v 4.0′ of set ‘Margulis PPW Actions v4′ is not currently available,” it indicates an incorrect version of the panel. Please reinstall. Let me know if you have any other questions! Thanks. An idea occurred to me to try out… I uninstalled the PPW panel. I then right clicked on cc2015 and “ran as administrator.” I then reinstalled cc2015 panel. After then exiting and restarting cc2015 the panel works! Did I miss that step in the install? To run as an administrator? If it is not in the instructions, I’d recommend at least putting in a note to give it a try if you have any problems. If it is in there, I apologize for missing it! Thanks for letting us know about this. I’ve added a note to the page; we’ll soon see whether this is a general requirement for Windows users. *If you are reporting that the options panels cannot be accessed in Photoshop CC2015, verify that you are using Photoshop v. 16.0.1 or higher. – it works somehow. But not the all buttons. It seems that half of the buttons at PPW panel doesn’t operate. When I press them – nothing happened. But some works. I can see 14 actions under PPW group in actions menu….. Try uninstalling and then run PS as an admin WHILE you install the PPW panel. That’s what fixed it for me. Because your problem sounds exactly like what was going on with mine…. Doug, thank you very much! 1. Uninstall PPW in PS in AdminMode. 2. Install PPW in PS in AdminMode. 3. Restart PS in AdminMode => PPW works. 4. Restart PS in AdminMode => PPW works! In my experience you do not need to run in admin mode after you install, just while you install. Glad it helped!!! Doug and Vladislab, thanks for your reports, I have updated the page. Many thanks for the actions and panel, they are a fantastic resource. I have a small problem after installing the panel in Adobe Photoshop CC 2015. Profile at this gamma is not installed. *Whether you have administrator privileges; if you are using Windows, have you tried right-clicking Photoshop and run as administrator while you were installing the panel? I get the same thing, “Icc profile at this gamma not installed” for the 1.4 and 1.0 gamma’s. The false CMYK seems to work fine. Thank you David for the report. Seems to be a Windows problem loading and reading ICC profiles from that folder as for Mac all seems to work fine. I will fix this issue for the official release of the custom installer. Copying the false icc profiles folder to C:\Program Files (x86)\Common Files\Adobe\Color\Profiles works. Many thanks for solving this issue. My files existed in the AppData folder as well. I will move them to the Program Files folder too. Thanks for the help! No issues with the panel here in Toronto too. Ps 2015.0.1 + Run as admin + ICC false profiles. It applies twice if the image is in Lab and I choose Continue. Checking the layers’ name and grouping, it looks like “the second” bigger hammer is applied 3x to each layers resulted from the first bigger hammer. Is it a loop somewhere maybe? thanks for the report, I could replicate the issue and seems a further bug just on windows system. Will be fixed. The PPW panel is a wonderful and useful tool to have. To design it was a great idea that complemented the method of using Lab. Congratulations and thank you for maintaining its lifecycle. I used the panel with CS6 and CC2014, and I can’t see any traces of it left now. I’ve tried to fixes, per Adobe message boards: I’ve checked plugins: Enable Generator and I’ve unchecked “Allow Extensions to connect to the Internet”. Nothing has worked so far. This means that some some metadata on the files has been changed and that causes the digital signature to fail. Did you removed the previous PPW version installed on CC2014 using AEM? Have you modified something in the folder you have downloaded? To solve the problem you should uninstall The PPW and make a new clean installation downloading the zip file on your desktop again. 1)Uninstall the extension re running the installer and clicking the *uninstall* button. and manually delete them if you find them. 3) Download the installation package again and, without changing anything inside the installation folder, run the installer. I’ve followed the instructions you’ve given me and I’m still having the same problem. I have sent you an email, please be sure it doesn’t go into your spam folder. Hi I have a small problem with the two sky actions in the panel. If I have a layer stack that has some single layers, then a layer group, then some more single layers when I run either Darken Sky SC or Darken Sky B from the panel, as the script runs I can see the sky layer being created at the top of the layer stack then right at the end the Sky layer gets moved down the stack to be on top of the group layer. (I have also noticed the sky layer get put in a group but haven’t been able to reproduce the steps to recreate this). As far I can tell running the action alone it always works with the sky layer on the top of the stack, the sky layer getting moved down the layer stack only happens when running from the panel. I experienced the same issue in some condition and I will fix the problem. There is an incorrect move at the end of the process that push the Sky layer somewhere on the bottom. Because the action is performed correctly, excluding the final displacement, you can move the layer on top of the stack or use the action in the action panel until we fix it. Thanks Giuliana, much appreciate the update. I have noticed another small issue with the H-K action. The action is looking for the Genuine background layer. Sometimes Lightroom or Adobe Camera Raw will pass the file to Photoshop with a name of Layer 0 e.g. from a Pano merge. Renaming to Background was not sufficient. I found a work around, select Layer 0. Then, in the Layers Menu select New, then select Background from Layer which creates a real Background layer. I wondered if the H-K action should create a merged stamp visible layer and use that, or use the bottom layer. Not sure of the answer but thought I would post my findings. I cannot replicate the issue on my own, I should know the exact condition of the file because this problem was fixed creating a true background layer. I need to know exactly how layers are composed , color mode and option chosen when running the action from the panel. Thank you again for all your reports. I can reduce as follows. Open a new file in Photoshop, it has a single layer called Background which is locked. Then double click the layer and OK to rename it Layer O. Run H-K from panel with no options – as it is a single layer the panel action just runs. It only creates a H-K Effect layer. There is no “Color Only” layer or the H-K group created. Delete the H-K Effect layer just created, Select Layer O, go to Layers Menu, Select New, then select background from Layer which regenerates a true Background layer in Italic text. Run H-K from panel and it works as expected, two layers in a layer group. confirmed. That will be fixed too. Hi, seems like I’ having problem even before I start loading the file into PS. I tried to leave the PPW folder in the Download folder but after selecting File> Scripts> Browse, I cannot see the PPW folder anywhere. I’m using Windows 7 Home Premium. Looks like is my system doing something wrong. Is there another way to get the PPW folder into PS? after downloading the zip file, right click it and select “extract all”. Then right click the *PPW Tools v 4.0.7 (CC2014-CC2015)* folder and select “extract all” to unzip it. Now drag the uncompressed folder onto your desktop. I tried to “unzip” the folder but I still get the same error message even before I move it to the desktop. I have no problems unzipping any other folder. I was finally able to load the panel, but I had to unzip every single file in the folder, because for some reason it didn’t let me unzip the whole folder. Evviva! Un caro saluto a tutto a te ed a tutto il team. In gamba! When i use Bigger Hammer, the Options Window do not opens. Why ? *Verify that you are using 4.0.8, which is the latest version. * and the Sharpen 2015 button. Yes. I pull Photoshop up from the “start” menu and right-click on it to run as admin. I do get a message asking if I want to allow Photoshop to make changes to the computer – I click “Yes”, but other than that Photoshop seems to open ok.
and give us the answers about the specifics of your system and an exact description of the problems you are having. I am using the latest Photoshop CC version to which i just updated on OSX El Capitain. I have downloaded the latest beta form the resource page and installed by dragging the proper file to the PS icon. I suppose you are Italian but, as I’m not sure , I’ll write in English hoping that this answer can be helpful to all. To solve installation problems we always need that you give us more information, e.g. the installer’s version you have used, the exact Photoshop version you are running and the panel’s version. From the error message that you describe does not seem you have installed the latest (4.0.8) version of the PPW panel. 1) Uninstall the extension by running the custom installer and clicking the *uninstall* button. If you find any, manually remove them. and, without changing anything inside the installation folder, run the installer. 4) re open Photoshop and open the PPW panel from the extensions menu, it should be the 4.0.8 version. The actions Set that is loaded in the Actions panel is now “Margulis PPW Actions v 4.2”. Anyway you should keep in mind that the panel does not use the set of actions and it works independently. I am using PPW panel in photoshop cc 2015 version 2015.0.1 release, all action works fine but option clicking the ‘big hammer’ does not open more option for big hammer action as described. I have read the manual and reinstalled it but of no use. Help me on this issue. Which OS (Mac or windows and version) are you using? Looks like the first uninstall did not remove the folders. “I’ve downloaded 4.0.9. MMM + CB crashes when I alt click on it in cc 2015 and cc2014. I am on a MacBook Pro, running 10.11.2 with an AMD Radeon HD 6770m 1024 MB graphics card. The only way I can exit PS is to force quit it. This happens regardless of how I make my selection. The same crashing happens when I alt click on Sharpen 2015. I meant to include in my first messaged that my MacBook Pro has 16 GBs of ram. 4.0.9 is installed in cc 2014 and cc2105. In both instances (MMM + CB and Sharpening) each file began with Background layers only, so I ran both panel actions inside the file. I also ran them in duplicate documents with the same results. I never received an error message. In each instance, PS merely froze after each dialogue appeared. I had the prior version(s), which I did not mutually uninstall. However, only 4.0.9 appears in the Extension list. I am a subscriber. I’ve reset all three panels. I reinstalled 4.0.9 – no change. I deleted the folders inside Chromaline_software and reinstalled 4.0.9 again. No change. There were no uniform channels. I will contact you by mail for support and to investigate the issue. Thanks so much. Very good to hear from you. “This file name(s) would be too long for the destination folder. You can shorten the file name and try again, or try a location that has a shorter path.” (No error code is given. his text appears with a specified file). The extraction process pauses and a message or error code above will be given, along with a file name or folder name, with file type, date modified, and time. File names beginning from the period used in the file name, and through the final true extension, are listed. The problem may be that periods were used in the file name and it is being read as an unrecognizable file extension. The conundrum is that I cannot get access to the files to shorten the file name until I can extract the files from the zip folder. And this might be a bad idea, anyway. The file extractor stops the extraction process with each file that falls under error 0x80010135: Path too long, so I can see every file that it rejects. It includes Java Script files, pdf files, folders (csxs folder, icons folder, js folder, jsx folder), as well as a file that has a very long extension: ._com.cromaline.PPW-Documentation (extractor reads the file type as .PPW Documentation…?). What can I do to solve this problem and download the PPW panel?!? I have version 4.0.1 on my Photoshop CC 2014. I would like to check out your latest and greatest, version 4.0.9. PS: when the time comes to actually install the PPW 4.0.9, I may have trouble running Photoshop CC 2014 and 2015 as administrator, unless I am the admin. by default, and it will be a non-issue. There appears to be no way to right click on the app and gain access to the “run as admin.” command, since my Photoshop software is run through the CC interface (or through Bridge). Note that I was able to extract some files successfully from the zip folder, which includes the instruction video of how to do the install for Photoshop CC 2014/2015. FYI: In my Adobe Extension Manager CC, PPW Tools 4 Version 4.0.0 is listed and box is checked for both Photoshop CC 2014 64 bit and 2015 64 bit. (would love to see 4.0.9 listed!). You was right, the zip file must be downloaded onto your desktop. You must run the PS app “as an Administrator” (see the attached pdf for instructions), only for the installation process. The options panels cannot be accessed!!!! All components are correctly installed. I have used the uninstall feature and repeated the above sequence with the same results. I repeated the procedure with a clean download with the same results. I was previously using CC2014 and the 4.0.5 version of the panel, but as I noted above I wiped the drive before upgrading to El Capitan so there are no other versions of PS or the panel on the system. *Verify that you are using panel version 4.0.9, and that there are no duplicate folders as described above. No duplicate folders. Used the uninstaller supplied in the download to clean the system and then reinstalled the panel with the same results. See above for results on the duplicated layer. The results are the same for a single layer file called Background (and locked) or on Layer 0 and unlocked. This user does not have administrator privileges. I always ran with a standard account in the past with no issues. See above. I started with a clean slate but attempted the PPW panel installation several times with the same results. No change in behavior after resetting preferences. I didn’t run the full sequence of tests, just the ones that failed before. *If you are reporting that certain type in the options panels is illegible in Photoshop 16.1.1, this indicates that you are not using version 4.0.9 of the panel. Please reinstall. *If you are reporting that certain panel windows that you have previously closed spontaneously reopen which you switch to a different application, it indicates that you are not using version 4.0.9 of the panel. Please reinstall. *If any of the four actions Bigger Hammer/MMM/MMM + CB/Sharpen 2015 don’t seem to be working properly, or give an error message, remove all five PPW folders inside the Scripts/Cromaline_Software/ and re-run the installer. See above. Tried multiple times without success. *If the above procedure does not correct the problem with Sharpen 2015 or the Bigger Hammer action, please a) attempt to run the other action from the panel and tell us whether it works normally; b) please try to run both actions not from the panel but from the Filter menu bar (the installer puts a copy there automatically) and tell us what happens, and whether it is the same thing that happens when you try to run it out of the panel. There are no PPW filters listed in the filter panel! *If you are a Windows user and reporting that the RGB false profile actions don’t work, be advised that this was a bug in the 4.0.6 release. Reinstalling version 4.0.9 should solve the problem. Regarding my earlier post I reinstalled the panel with the new release of PS that came out today (June 8, 2016) with the same result. An interesting note- About PS reads 2015.1.2 and 20160113.r.355 x64 as before even though Creative Cloud said it was updating PS. I will investigate the issue. some files that are necessary to the panel seem to be missing. Probably they were not installed because some Adobe folders need Administrator privileges. Log in as an Administrator and run the PPW installer again. Adobe just released PS CC2015.5. When I updated PPW 4.0.9 stopped working, basically behaving as I described above. I then reran the PPW installer (as an administrator) and the installation failed. Two messages appeared. The first was a warning that 4.0.9 only worked with CC. The second said Bad Photoshop Version, 17 not in the range [14,16]. Does the installer not work on the latest version of PS? I noticed that it did remove the already installed PPW. Up to now, I’ve had no success getting the options on the panel working using the alt/click. I’ve tried all suggestions on this website, including re-installing Photoshop, the panel, deleting folders etc. However I have just discovered a workaround that may be of use to other Windows PC users. If you go to control panel, under “ease of access”, and turn on the “on screen keyboard”, you can click the ALT key on the onscreen keyboard before clicking any of the blue buttons on the PPW panel and WHOOPEE! the options all come up OK. I’ve tried for months and almost gave up on the options, but now with this method, I can finally access them. thanks Dan and Giuliana for the PPW panel. It is great! just one further bit of info, the best way to bring up “on screen keyboard” on a Windows 10 machine is to click the “windows symbol” bottom left, click “all apps”, scroll down to and click “Windows Ease of Access”, then click “on screen keyboard”. You can close it when not needed for PPW. I am unclear which version to use with Photoshop CC 2015.5 latest version. Robert, information about current versions is always updated on our free resources page. Finally, Sharpen does not show in Filters menu as it has done previously. I am installing in admin account, and have tried all of the above steps, including manually placing into CEP folders etc. Welcome your help and insight! Thank you + all best, Kohai. I’ve installed the latest PPW on 3 different Macs running CC2017. Everything seems to work OK apart from option-clicking the “color” buttons. Each button works as expected when the option key isn’t pressed. Martin, This is likely a permissions problem. Please see the paragraph “Many problems can be caused by lack of proper permissions during the install”. If this does not solve the problem, please go to the section ““If you have what appears to be a successful installation and can open the panel, but certain features aren’t working properly,” and give us answers to all the questions there. Recently moved to Photoshop 2017 and I am experiencing a small problem with the new PPW panel. try to select one of A>B A=B or B>A but the button under the cursor disappears. Pressing in the empty area still results in action being run but there is no button visible at all. *Verify that you are using panel version 4.1.1, and that there are no duplicate folders as described above. Confirmed running PPW 4.1.1 no duplicate folders found. In fact all buttons show same behaviour in this panel and disappear when the cursor is placed over them. Yes, installed with run as admin. PPW previously installed in Photoshop 2015.5, not previsouly installed in 2017.1 this is a fresh install in 2017.1. No errors during installation. Yes, no change, error above still present. Does this only occur when the action is alt-clicked while the file is still in RGB? IOW if you click the button that converts to LAB first, then alt-click the action, does it work correctly? If that is the case, unless Giuliana feels otherwise I do not consider that this merits attention inasmuch as the workflow isn’t standard and the workaround is a single click. If it is *not* the case, have you tried the solution suggested in the troubleshooting page? My findings are as follows. 1) Convert photo to LAB first. Then press alt and MMM+CB button. No change in this secondary window all the buttons disappear when you place the cursor over them (and reappear when you move the cursor away). 2) Deleted all five PPW folders inside the c:\prgoram files\adobe\Photoshop CC 2017\Presets\Scripts\Cromaline_Software ( I left CPT folder in Cromaline_Software). Reinstalled using run as admin from Photoshop. No change the disappearing button problem remains. Not sure why this only affects the secondary windows that pop-up when uisng the alt key. The main window is fine but the button problem is consistent for the secondary windows. Giuliana will look at this over the weekend. No one else has reported the problem. I have found an inconsistency between the panel and the actions for the Big Hammer. I am experimenting with the action trying to create a halo mask automatically on the mask for the unblurred layer. Work in progress for this idea but I keen to make sure the blend mode is correct in the action. Should this be normal for the unblurred layer? I think that Darker Color is a slightly better choice for the Unblurred layer in Bigger Hammer than Normal, because it is more likely that the layer is going to be used to minimize a light halo than a dark one. However, to get the best use out of the layer one may have to change the mode on a case-by-case basis. I will make a note to reconcile the two in the next release. I know the the Lesser and Velvet Hammers only run on files in 8 bit mode. I think this is because they use the smart blur filter. I was wondering what Dan and the team thought of using the surface blur filter instead of the smart blur filter for 16 bit images? As smart blur also blurs an image while preserving edges I wondered if this a valid approach to experiment with. I know the surface blur takes a long time to run but I can live with that. I am keen to keep a 16 bit file so interested to hear your thoughts on using the surface blur filter for the Lesser and Velvet Hammers. Upon investigation, Giuliana states that the “invisible buttons” symptom is a known scripting bug in Photoshop 2017 for Windows. However, in her testing, and according to others, although the buttons are invisible their functionality is still there if you click on the empty space. So the options panel should still be usable. If the bug is not corrected in the interim, she says there is a scripting workaround that will be incorporated into v5 of the panel. Thanks for the update on the “invisible buttons” problem. Glad it is a known issue. If you need any beta testers for the next release of the panel I am happy to help. I think I have spotted a new problem in that the layer order maybe incorrect in the Bigger Hammer panel so I thought I would report it for review. Run Big Hammer from the panel using alt key to bring up the options menu. At this stage the “Retain Original Colur” layer is at the top of the stack. Click OK in the panel, the Bigger Hammer group is created and the “Retain Original Color” layer gets moved below the “Unblurred” layer. Now use white brush on the mask area of the “Unblurred” layer mask. This is the problem in that this now restores the enhanced colors in the area of the mask painted white from the Big Hammer as well as removing the halo. If you then move the “Retain Original Color” layer to the top of the stack the retain color works as expected. I think the “Retain Original Color Layer” should be at the top of the layer stack by default. Extensive testing unexpectedly showed perceptibly superior results with Smart Blur rather than Surface Blur in this particular action. We do not devote development resources to 16-bit because all known testing indicates no advantage for it during real-world operations with real-world color photographs. David, I wouldn’t say that the layer order in this particular BH option is incorrect as such, but what you suggest is more logical, so we will implement the order change for the next version. Thanks for pointing it out. 1) When I double clicked on your installer in the panel download, it went to a Script manager and did not give me an “install” screen as shown in your PDF (win). However, when I went into Photoshop and File>script>browse, and found the “PPW-4.1.1-installer” jsx (?) file, it installed immediately and correctly. Maybe I missed something but fyi. 2)Your fans, and certainly me, would love another book, and updated edition, or a boot in the pants of one of your talented followers to do their own book. I am like many who find that I cannot get enough examples. Perhaps just another round of videos? 3) I continue to astonish myself with the amazing changes in my photos using your methods. I am a book person and have close to all the Photoshop books written, and all of them together do not deliver one half of the insight or improvement that your book(s) provide. 1) As I recall the installation procedure you are supposed to drag the installer onto the Photoshop version’s icon rather than double-clicking it. But, as you managed to get it working anyway, no harm, no foul. 2) I think I’ve done enough bookwriting for one career. There’s a lot of world to see, and I’m not sure how long I’ll be around to see it, or for that matter, how long it’s going to be around to be seen. Off and on I work on an updated version of Chevreul’s text, with commentary and graphics on how it affects our work today. But no guarantees on when it might be ready, or if anybody is interested in publishing it. Plus from time to time I’ll post blog entries here. 3) Such kind remarks are always welcome and make some of the hard work seem worthwhile. The problem with always looking for new ways is that they have to be tested, and much of the time the tests show that the new way isn’t particularly better than the old way. OTOH the readers of my books have to do a lot of work themselves, as you have no doubt found out. One reading isn’t going to do as much as three. 时间去那儿了, no one on our development team speaks Chinese. I know that language differences cause difficulties; this week at my applied color theory course in San Diego there was a gentleman from Beijing who was enthusiastic, but somewhat hampered by the language barrier. Unfortunately, though, subtitles for these videos are not possible unless someone else undertakes the work and expense. Hi, Dan. First of all, thank you for your revolutionary work on the PPW, it is so amazing. I love it so much that I’m using it everyday. I just have a little problem. In “bigger hammer”, there’s an option window which, like you said in the video, could show up if option clicked. But unfortunately , I’ve never seen this window, no matter how hard I try. Click “option” or not, there’s no difference. Same thing happens in “MMM+CB”. Is there anything wrong? What can I do? “If you have what appears to be a successful installation and can open the panel, but certain features aren’t working properly.” Give us all the details requested about your system, and an exact description of what is happening, including the text of any error messages. I’ve reinstalled the PPW of version 4.1.1, but still, there is no option panel. I option-click the “bigger hammer” or “MMM+CB”, it just runs out the “bigger hammer” or “MMM+CB” result, no option panels occur. Unfortunately this still does not give us enough information to respond. Please go back to the troubleshooting page and answer *all* the pertinent questions. Right now we can’t tell whether you have tried all the recommended procedures, whether you’ve tested the menu bar, or even whether you are an administrator, since this is likely a permissions problem. In any case Photoshop CC2015 is not a current version. If this problem cannot be solved easily the suggestion would be to move to CC2017. On windows, the uninstaller will only delete files installed by the installer, so it should never delete your presets/scripts/Cromaline folder. I did not tell it not to delete cc2017 and that is the only folder which still remains. After copying it to cc2018 folder the panel seems to be working, although I have not yet tried all of the actions. I’ve problem installing PPW on PSCC2018 with a fresh install. I’m on windows 7 OS, 64 bit. Do qou have any hints? Adobe Extension Manager is incompatible with any version of Photoshop after CC2014. Make sure you have downloaded version 4.1.1 of the panel, and follow the installation instructions. ppw 4.1.1 panels issue in photoshop cc 2018 19.1.3 – win 7 64bit -. bigger hammer, sharpening, mmm+cb and mmm does not work. Works fine in photoshop cc 2017. Works if you play it from action menu, but not from panel. I really appreciate your reply. Been using your panel for a couple of years now and it saves me quite some time. Your books and tuts are amazing, there’s so much to pick up and learn from them. I did all the troubleshooting but nothing seems to work. Moved the folder from PS 2017 to 2018, unistalled the panel from PS 2017, uninstalled from 2018 – reinstalled as admin checked permissins etc… as a last resort I uninstalled PS 2017 and then installed the panel to PS 2018 as admin again, and now everything works. Seems to be some interference bug between the two versions. win 7 pro x64 sp1, 500GB ssd, 24GB ram, PS 2018 19.1.3, wrkspace profoto. YES I am using 4.1.1. *The exact version of Photoshop that you are using, taken from the “About Photoshop” panel Adobe Photoshop Version: 19.1.4 20180507.r.325 2018/05/07: 1170750 x64 If you are reporting problems with Photoshop CC2018, have you verified that the folder Adobe Photoshop CC 2018/Presets/Scripts contains the folder Cromaline_Software? Michel, Thanks for the very complete answers to our questions. The good news is that we just this moment announced that the release of panel version 5 is imminent. In all likelihood it will solve this problem. Monitor the free resources page to see when it will be available for download. Ciao Giuliana, scrivo in italiano per non usare google. Ho dei problemi con l’installazione del PPW. Il mio sistema e windows 10, photoshop 2018. Ho creato anche un account come amministratore, sulla finestra che compare e scritto: non è il tipo corretto di documento. Bruce, we have no reports that the site is malfunctioning. I have just tested the download myself and it works fine. Problema istallazione risolto…ma non trovo istruzioni. Giovanni, le istruzioni per l’uso del pannello si trovano nel pannello stesso. Nell’angolo in alto a destra, fai clic sul Main Panel e seleziona Documentation. Un secondo pannello si aprirà e offrirà PDF su ciascuna azione. Once PPW 5 was installed it showed up in the PS Window extensions, but would not open. Thank you for any help. Running mac OS Mojave 10.14.1; file downloaded PPW_5.0_cc_052718; Both “Load extension Panels” and “Allow extensions to Connect to the Internet” were checked; Other loaded extensions were PPW Colors Help and PPW Documentation, neither of which would open; PS version, PS 20.0.1 (CC 2019); Version is subscribed, not a trial; PPW version 4 was running on the above referenced version of PS, and was uninstalled when 5.0 was installed; Ran installer according to directions, message from installation window was PPW successfully installed. Scott, this is likely a permissions issue. I have added instructions for how to perform a manual installation on the troubleshooting page. Give that a try and let us know if it works out.